Lightly coat a 15x10x1-inch baking pan with nonstick cooking spray; set aside. In a large bowl, lightly beat egg white. 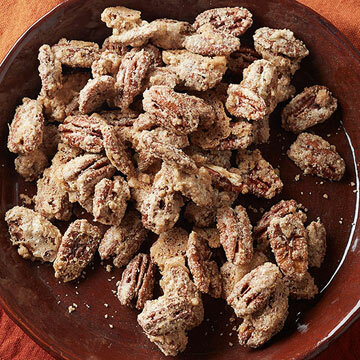 Add pecans and toss to coat. In a small bowl, stir together sugar, pumpkin pie spice, rosemary and salt. Add to pecans and toss to coat. Spread pecans in the prepared pan. Bake at 325 degrees F for 20 minutes. Spread on a piece of foil, cool completely. Store in an airtight container at room temperature for up to 1 week.